Late at night on Thursday, April 5th, burglars broke through the brick wall of Durham University’s Oriental Museum, smashed two display cases and stole two Qing Dynasty artifacts worth a combined $3.2 million. That’s undervalued in terms of market pricing, I’m sure, because Chinese antiquities are breaking sales records left and right these days, and it’s undervalued in terms of historical and artistic significance. 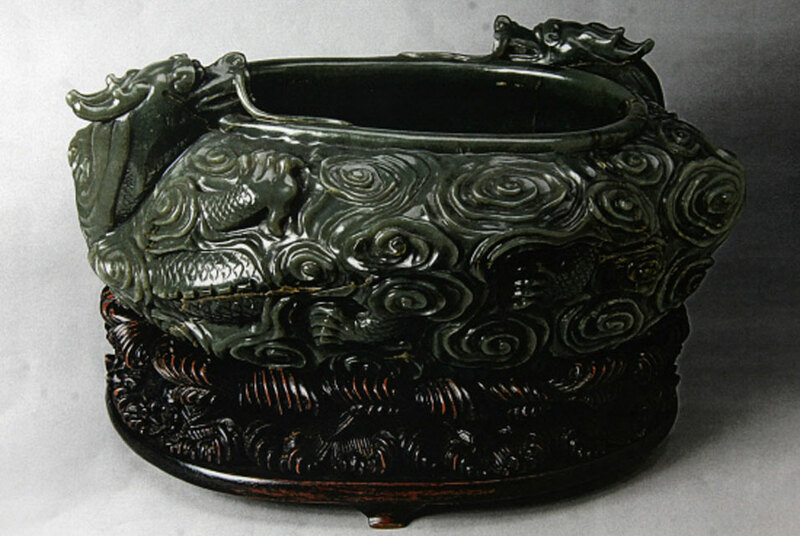 The museum considers the artifacts, high quality pieces from China’s last imperial dynasty, priceless. 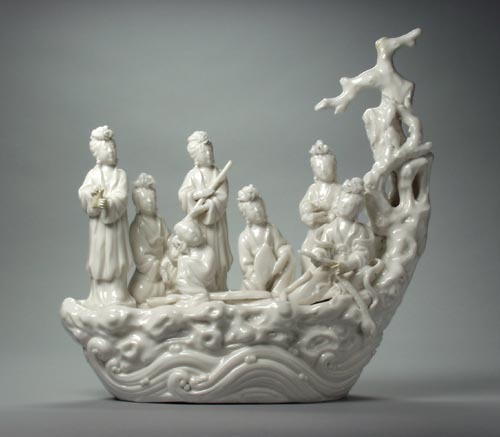 The objects are an intricately carved, dark green jade bowl from 1769 and a Dehua porcelain figurine depicting seven fairies in a boat from the 17th century. 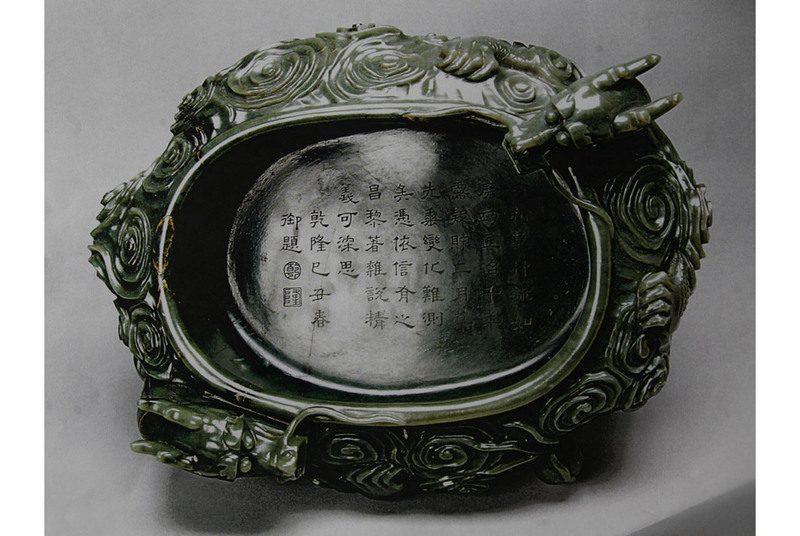 The bowl has a poem engraved on the inside bottom. The figurine is covered inside and out in a milk-white glaze known as blanc de Chine that is characteristic of the Dehua area kilns. They are easily portable and highly desirable to unscrupulous collectors. The senior investigating officer, Det Supt Adrian Green said he estimated the burglars had been in the premises for only a minute or two at the most once they forced entry. “It seems very clear that this was a well-planned, highly organised break-in. They have spent around 40 minutes creating a hole in an outside wall and when it has been big enough, they have entered the gallery and made straight for these two items,” said Det Supt Green. Alarms did go off, alerting museum security and the police, but the burglars were able to escape before the authorities got there. Durham Police are pursuing the case with vigour. They are looking for any information people might have regarding the movements of a light blue Audi A3 and an orange Renault Megane. The cars were spotted in the area right before and after the crime. They’ve also arrested five people already on suspicion of assisting the thieves or conspiracy to commit burglary. The five suspects were interrogated and then released on bail, but police want one of them back. The authorities have released the pictures of two people they’re particularly keen on interviewing, Lee Paul Wildman (35) who was one of the five suspects detained earlier, and Adrian Mark Stanton (32). Should you have any information about the burglary, suspects or cars, please call the Durham Constabulary at 0345 60 60 365 or Crimestoppers at 0800 555111. Sadly, the museum will be closed until further notice.